Some plants are so reliable, accommodating and long lived that they earn the sobriquet ‘Bomb Proof’. As soon as I say that there will be howls of complaint that all my bomb proof selection have failed in one garden – well all I can say is you should not need green fingers to grow this bomb proof selection. Rosa Rugarosa or Dog Roses are found wild in hedgerows and that means they survive what ever the British weather throws at them. Taxus or Yew trees grows quicker then expected and can be pruned, trimmed and shaped. Old specimens in church yards can be several hundred years old so your tree is likely to outlive you. The Grass in my lawns has been through drought, flood and plagues of children. I chop it down with a mower at least 30 times a year and treat it badly. It may go brown, grow some moss or suffer from Fairy rings but the green grass keeps coming back. If that fails there is also the horrible Gardeners Garters the stripy grass that is worse than couch to pull out. Cat mint or Nepta Six Hills Giant is a robust plant that grows to 18″ but it prefers full sun. It is extremely drought tolerant and will grow in poor soils. Some plants survive like weeds and in my garden Creeping Jenny Lysimachia fits into this category. 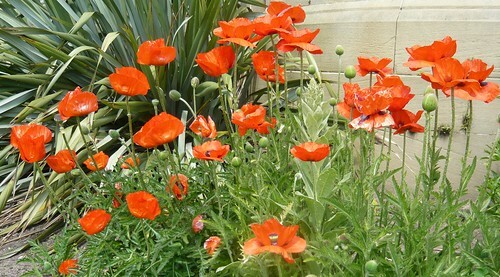 Poppies are almost bomb proof due to the volume and longevity of the seed they produce. Iceland poppies and opium poppies Paperver somniferum are a couple of cases in point. Flowering onions or Alliums have hardy bulbs and once a plant is established they are adept at seeding and growing colonies. To be a true bomb proof plant they should not be fussy about the conditions in which they grow. There are many long lived plants that love woodland or thrive in moist conditions and you could make your own list. Indoors, one old favourite the Aspidistra elatior or The Cast iron plant has survived since my Grannie time and Spider plants also seem to go on for ever. My Inulas are proving to be very hardy and even hard to remove. They are only 20 years old so that is still young and I will try kill them off again this year. See our sister site Gardening Products for tips and ideas on Garden products new and old. I’d have to add forget-me-nots and sunflowers to your list. Seeds have survived for several years in our compost (which moved with us when we came to Lee House 3 years ago) and pop up whenever we use it. The best example was the sunflowers which appeared in our hanging baskets last year! They grew to about 3′ and lasted all summer. Fantastic!